This entry originally appeared on What They Think in July, 2010. Eight years ago, while visiting the Library of Congress in Washington, D.C., I happened upon a photograph that captured my attention, and started a journey that has taken me in a variety of fascinating directions. The photograph is an image of the Emir of Bukhara,* in what is now Uzbekistan. The photo appears so sharp and brilliant that it must be modern, but the dress of the Emir, and the overall appearance of the image seems old. 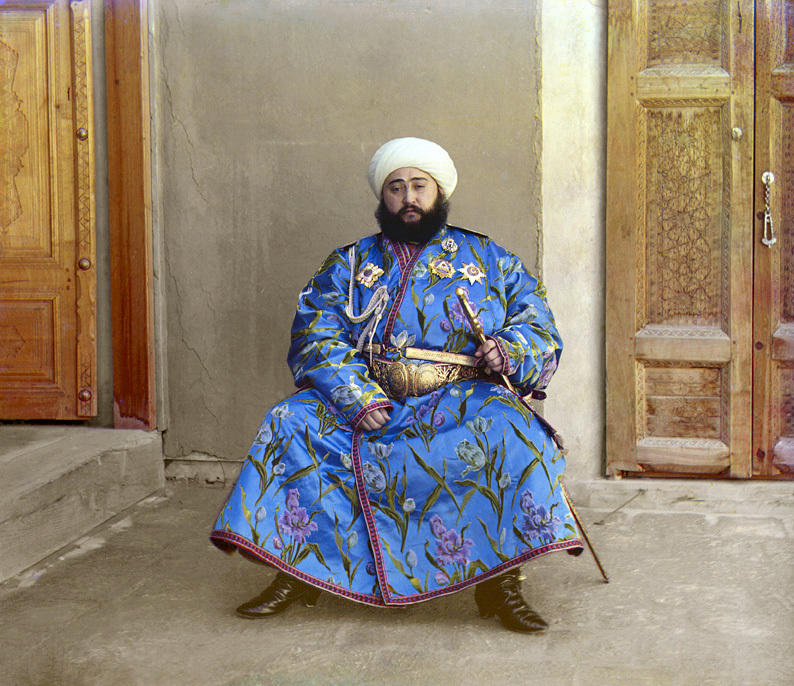 The glorious image of the Emir was taken by Russian photographer Sergeii Prokudin-Gorskii. 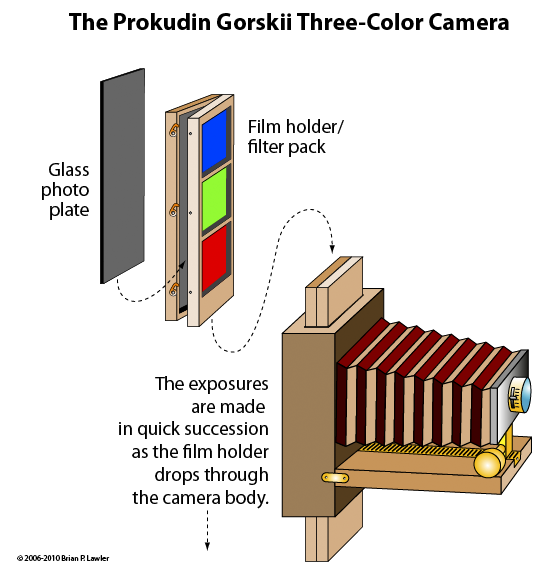 What is unique about Mr. Gorskii is that he was the first person in history to use color photography commercially. Color images had been made experimentally by photographers much earlier, the first is credited to James Clerk Maxwell in Scotland in 1861. French photographer Louis Arthur Ducos du Hauron (1837–1920) made successful scenic color photographs prior to the Russian’s work, but Prokudin-Gorskii perfected the process and made thousands of successful color photographs. Gorskii’s camera was probably made by him, but it was fashioned after a German camera that he had seen while visiting western Europe. His camera used glass negatives which slid in a special holder through the camera during the exposures. In each film holder were three colored filters – red, green and blue. Each filter colored the light passing through the lens on its way to the glass plate. The result was a grayscale negative glass plate with three color separations imaged onto it. In 1905 there was no practical way to print a color photograph, so Prokudin-Gorskii built (or had built) a three-color lantern-slide projector, a device which allowed him to project his images in color onto a theater screen. To make his photos visible, he contact-printed the glass negatives to glass positives, then he projected those positives for his audiences. Prokudin-Gorskii’s photos are remarkable. They are sharp, vivid photos that tell a story about the Russia he knew. And, he served the Czar well, producing images far and wide of his kingdom. When the Bolsheviks took over in 1918, Czar Nicholas and his family were executed. Those in the Czar’s service, including Prokudin-Gorskii, were forced to flee the country or be killed. Gorskii escaped into Finland, taking with him all of the glass plates he had made for the Czar, and he eventually made his way to France, where he lived until his death in 1944. Saving the images made Gorskii a hero of Russian expatriates and nations sympathetic to their cause. But, the French government had no money to support the photographer or to purchase his photos. France was preparing for the next war, and preserving Czarist Russian history was not important at the time. Eventually they became of interest to a researcher for the United States Library of Congress, who located them in the basement of a French apartment building. The Library of Congress purchased the images from the descendants of Prokudin-Gorskii, and they were brought to Washington, D.C. Though the photos have been reproduced numerous times, including a book about Gorskii published in 1980, it wasn’t until the development of Adobe Photoshop that it became possible for modern-day photographers to reconstruct the images made by this energetic photographer at the beginning of the 20th century. Every fall, while teaching my class in color management, I have my students take the Prokudin-Gorskii images and assemble them into color photos. They are required to assemble them in correct order, then to carry out color correction and retouching to make these images as good as possible. It’s an exercise in keeping history alive, working with color, and understanding the roots of imaging. A few weeks back, while sifting through a box full of photographic accessories in my office at the university, I came upon a nearly perfect set of color separation filters – Wratten four-inch gelatin filters in steel frames. As I admired these “relics” (I used them in a class I took back in 1972) I wondered if I could recreate the method of work of Sergei Prokudin-Gorskii using my modern digital camera. And, this morning I set up my first experiment to retrace his photographic steps. Brian Lawler is a Professor of Graphic Communication at California Polytechnic State University, San Luis Obispo. He writes about graphic arts processes and technologies for various industry publications, and on his blog, The Blognosticator. This entry was posted in Art, History, Photography. Bookmark the permalink. That is a remarkable picture. I posted last week about making color images of comet Lovejoy from red green and blue images. A reader pointed me to your story. What an interesting account. Yes, tri-color photography is amazing. I have recently been working with images taken by the Curiosity Rover on Mars. JPL has the rover take six or seven monochrome images through various filters at each location. If I choose the correct set of three images, I can make beautiful (?) color images of the surface of Mars. Curiosity has the same set-up that Prokudin-Gorskii had in 1912, it’s just automated, and on another planet! Eric on Why do people (people) put numbers (numbers) in parentheses? John on Why do people (people) put numbers (numbers) in parentheses?